Alaska’s vast size, sparse population, and difficult terrain makes communication and transportation across the state a challenge. Its regional isolation also leaves many Alaskans dependent on limited supply chains for crucial commodities. As a result of growing concerns over potentially hazardous disruptions to Alaska’s critical infrastructure, whether man-made or natural, the State of Alaska, Department of Defense, and several private sector organizations set out to develop a central, cross-sector mechanism to gather, analyze, and disseminate critical infrastructure information during periods of vulnerability or threat. These efforts resulted in the formation of the Alaska Partnership for Infrastructure Protection (APIP) in 2004. The mission of APIP is to protect infrastructure essential to all Alaskans by improving collaboration and interoperability between the public, private, and non-profit sectors. With the support of leaders like John Madden, Director of the Division of Homeland Security & Emergency Management for the State of Alaska, APIP continues this integrated team approach to addressing hazards through extensive information sharing, continuity of operations planning, and complex threat scenario exercises. Recognized across the nation, APIP’s Alaska Shield exercise program received acknowledgment from FEMA as the nation’s 2014 Capstone Exercise for securing a more resilient nation. John has served as the Director of the Division of Homeland Security & Emergency Management for the State of Alaska since 2007. During a public service career that has spanned 46 years, John has served in seven different federal agencies and on the boards of numerous national and regional organizations. He has spent the past seven and a half years making homeland security in the state of Alaska a collaborative discipline rather than a reaction. John describes his professional background as “a long and checkered federal career.” He began his federal service at the age of 17 when he enlisted in the army and served in both Vietnam and Washington, D.C. After completing his military service, he went into federal civil service. Over a span of 37 years, John worked across seven federal agencies in a variety of career fields including, program and project management, weapons engineering support, budget and finance, procurement, logistics, program and policy analysis, continuity operations, disaster relief, and federal airport security. When he left federal service, the Governor of Alaska contacted him to request that he serve as Homeland Security Advisor for the State of Alaska. With support and guidance from the governor, John saw this as an opportunity to engage citizens to establish a problem- solving approach that would make homeland security a proactive discipline rather than a reactive agency. John credits his diverse career path with providing him enough breadth of understanding to combine his years of work experiences into a single functional framework for a new integrated discipline approach to homeland security. While in his late twenties, John worked in the Office of the Joint Cruise Missile Project. The Joint Cruise Missile Project was the largest collaboration between the Navy and the Air Force since World War II, and was designed to quickly develop all platforms of the cruise missile during the height of the Cold War. During his involvement with the project, John learned the swift organizational skills necessary for rapid and cohesive decision-making in a critical situation with national implications. He saw first-hand how people worked to reach a clear goal when under pressure, and learned how to develop, research, test, and evaluate a plan during periods of uncertainty. John also watched how military experts gathered the right people around them to make a “problem-solving enterprise” that viewed problems as things to be solved rather than impediments to progress. This prior exposure to interagency collaboration during an emergency situation ideally prepared John with the skills necessary to swiftly coordinate APIP’s cross-sector responses to infrastructure hazards, like the Mount Redoubt eruptions in 2009, which occurred with little advanced warning. Throughout his career, John has come to understand that regardless of sector, no plan makes a decision; accountable people make decisions. This understanding of accountability and the chain of command has enabled John to identify leaders and decision-makers across sectors, which helps facilitate the overall collaborative process. Often John has the authority to make a decision, but when that authority belongs to another community leader, John recognizes the need to work collaboratively with that person so that the group as a whole can make decisions in concert rather than in conflict. This recognition and demonstration of respect towards other leaders in the collaboration encourages participation in APIP, and allows participants in the partnership to move as a single interoperable unit towards a common mission. In addition to obtaining a Bachelor’s Degree in Political Science, John also took several graduate courses in Public Administration at George Washington University before moving to Alaska. Since both disciplines focus on integrating and accomplishing policies across diverse fact patterns, this academic path provided John with practical exposure to life skills, like how to think and serve within in the public arena. Rather than learn purely academic content, John gained an understanding of how to reason through the motivations that drive each sector, which later influenced his ability to communicate across sectors in pursuit of common solutions with APIP. John also cites years of organizational leadership observations throughout his career with giving him an understanding of when and how to use collaboration. He notes that collaboration for the sake of collaboration or without clear direction often impedes progress, and that the most successful collaborations are goal oriented and focused on a clear mission. John attributes his ability to carry out the mission of APIP with swift, positive, and focused action to his educational background both inside and outside of the classroom. Defining a common purpose keeps seemingly disparate stakeholders united towards a common goal. For APIP, the mission is clear: Protect infrastructure essential for all Alaskans by improving collaboration and interoperability between the public, private, and non-profit sectors. Alaskans understand the delicate logistics of living in an isolated state. Whether competitors or regulators, they recognize that their continued prosperity depends on protecting foundational supply lines from hazardous disruption. With this contextual understanding that no sector can function in pure isolation, all stakeholders in the partnership unanimously agree on the need to establish a unified approach to infrastructure protection. APIP solidifies this common vision through a clear organizational charter that defines the goals within APIP’s mission and the specific methods of accomplishing those goals. After 9-11, the State of Alaska, Department of Defense, and several private sector organizations realized the need for a cross-sector mechanism to gather, analyze, and disseminate critical infrastructure information during periods of vulnerability or threat. 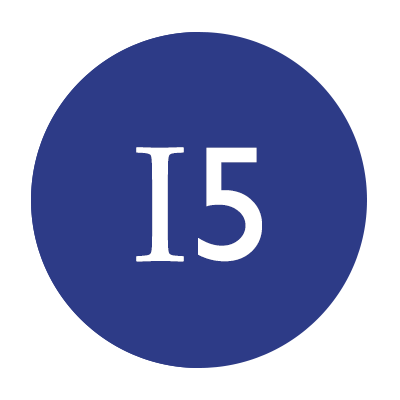 Early discussions on how to form this integrated network, however, resulted in little progress towards interoperability because of concerns over sharing proprietary information. 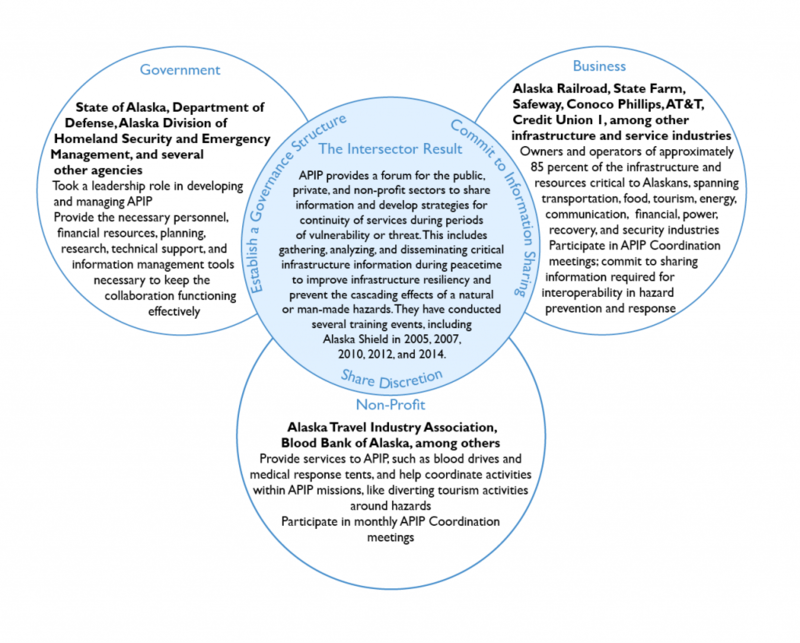 Recognizing that the success of the collaborative depended upon the full cooperation of the private sector – owners and operators of the majority of Alaska’s critical infrastructure – APIP founders broke down competitive barriers to information sharing by highlighting broad-scale interdependencies that enhanced group knowledge of the market-basis for participating in the partnership. Once stakeholders realized the financial incentives associated with improved interoperability, they became more comfortable sharing critical infrastructure information. APIP also developed a memorandum of agreement for information security before integrating processes, provided guidance to members on how to communicate sensitive information, and eventually developed a secure on-line information portal for use by members. Trust among participating members grew as local leaders witnessed the benefits of working collaboratively and realized that APIP effectively protected their sensitive information from disclosure. An example of this commitment occurred in 2010, after a C-17 plane crash severely damaged state railroad lines on a military base. On the day of the accident, APIP convened to determine how the disruption in train traffic would affect members of the partnership and the general public. The resulting discussion revealed a variety of sensitive information, including the quantities of profit and nonprofit details of what crossed the tracks. This open flow of information allowed APIP to prevent a larger ripple effect by prioritizing a response that diverted passenger services by bus, and provided the military with a comprehensive report that allowed their accident investigation to continue while the tracks were repaired. APIP meets monthly from September to May. These meetings focus on a theme or scenario related to infrastructure protection, like extreme weather events or cyber resiliency. Meetings typically begin with briefings from subject-matter experts before opening up into a larger group discussion. Most of the work takes place in one large session so that all participants can observe and contribute to each interdependency. All members attend monthly meetings, which prevents future confusion over the source of interdependencies. John describes the meetings as highly interactive and collaborative. Rather than have a small group of people make decisions or delegate tasks, APIP includes the whole spectrum of participants in the decision making process. If for some reason a disagreement occurs amongst participants, the whole group seeks a better understanding of the issue with a deeper discussion into the basis of the disagreement. Since most disagreements develop from a lack of understanding, working through the issue as a group typically alleviates any limitations to future progress. In the early stages of APIP, the most common disagreements focused on an industries role in a threat analysis. Sometimes a partner would think that a particular scenario did not apply to them, usually with regards to medical or cyber threat analyses. However, through continued exploration into the background interdependencies and context of the threat, all members of the collaboration would discover their role and find some way to contribute. This type of integrated approach to problem solving gives each participant in the partnership a distinct voice in the decision-making process while also reducing unforeseen obstacles in an emergency response. Between March and April of 2009, Mount Redoubt Volcano recorded nineteen major eruptions that sent ash in excess of 60,000 feet into the atmosphere, shut down hundreds of commercial/cargo flights, severely disrupted maritime shipping operations, and resulted in ash fall spanning 340 miles. After the first eruption, APIP convened to discuss how the eruptions would affect each sector’s ability to provide essential services. Once the group discovered all of the potential vulnerabilities, they rapidly found interdependencies and worked through contingency plans to fill gaps that would ensure all essential services were provided for. Despite occurring within 106 miles of Anchorage, Alaska’s major population center and transportation hub, each member of APIP made sure that no critical commodity experienced a shortage for the entire 60 days of eruptions. Continue its expansion to Fairbanks and Juneau. Currently APIP is centered in Anchorage, Alaska’s economic, population, and transportation hub. However, different areas of the state have different supply lines and therefore experience different challenges. Greatly increase collaboration on anticipating problems through collaborative vulnerability assessments and cyber workgroups. If APIP can better anticipate problems, then they can better adjust their priorities when building capabilities across the entire state.